The ASIFA-Hollywood Animation Archive has a fasinating Dispatch From Disney’s from 1943, detailing how Disney was contributing to the war effort. What fascinates me about these pictures is how subtle and how propagandistic they are at the same time. The Chinese guy is noble and yet innocent– he obviously needs Uncle Sam’s protection, but he won’t let us down once he gets it. The Jap is by no means as caricatured as in other wartime images, but he’s clearly a villain. And nearsighted. 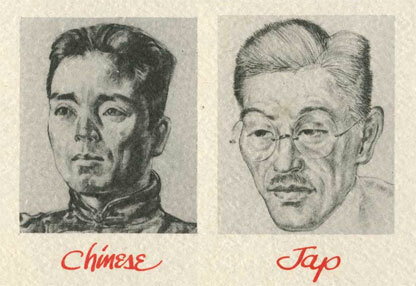 I would really like someone to explain to me why the WWII stereotype of the Japanese was that they all had bad eyes.